Keeping up his attack on the BJP and the RSS, Karnataka Chief Minister Siddaramaiah on Thursday called them "Hindu extremists" but the saffron party hit back saying it was the Congress which supported separatists. Keeping up his attack on the BJP and the RSS, Karnataka Chief Minister Siddaramaiah on Thursday called them "Hindu extremists" but the saffron party hit back saying it was the Congress which supported separatists. The BJP also dared Siddaramaiah to arrest its as well as RSS leaders. Siddaramaiah, who came under intense attack from the BJP yesterday for saying that the party and its fountainhead RSS had "terrorists", today called them "Hindutva extremists". "I had said Hindutva extremists," he told reporters in Chamarajanagara when asked about his remarks yesterday, which had stirred a hornet's nest in the poll-bound state. But, later speaking to reporters in Mysuru, Siddaramaiah said, "I had said they are Hindutva terrorists. I am also a Hindu, but I'm a Hindu with humanity, they are Hindus without humanity. That is the difference between me and... (them)," he said. He quoted a Kannada proverb to say that "it is like one touching his shoulder to check when called a pumpkin thief," implying that one with a guilty conscience needs no accuser. Calling Siddaramaiah "irresponsible" for linking the party built by Atal Bihari Vajpayee with terrorists, BJP MP Shobha Karandlaje today alleged that "if there is terrorism in this country today, Congress is the main reason for it, also for the situation in Kashmir. Accusing the Congress of having supported and encouraging the Khalistan movement, she said, "we have lost several officers, soldiers, leaders and also prime minister because of it." Karandlaje also alleged that the Congress had "sheltered, financed and trained" LTTE and its leader Prabhakaran. 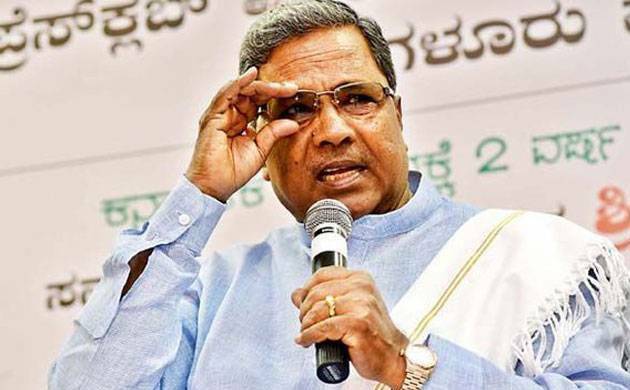 Siddaramaiah had yesterday alleged that the BJP, the RSS and the Bajrang Dal have terrorists within their organisations, a charge rubbished by the saffron party. "They are themselves like terrorists in a way. The BJP, the RSS and the Bajarang Dal also have terrorists within," he had said taking his attack on the ruling Congress' principal rival to anew level ahead of the assembly polls due early this year. Reacting strongly to the remarks, the state BJP had accused Siddaramaiah of desperately trying to polarise elections on communal lines "by calling BJP-RSS terror organisations". Senior state BJP leader and MLA Suresh Kumar asked when he would get arrested as he was from the RSS. "When will I get arrested? Chief Minister has named me as a terrorist, because I'm RSS," Kumar said in a tweet in Kannada. "I'm also RSS, arrest me too," he said in another tweet. Citing a spate of killings of Hindu activists in the state, particularly in the coastal Dakshina Kannada district, the BJP has been demanding a ban on Islamist outfit PFI and its political wing Social Democratic Part of India (SDPI) holding them responsible for it. On the other hand, the PFI has blamed the Sangh Parivar for the killing of those from Muslim community in the region.